The Underground Grotto and the Papal Letter. Yesterday UCAN posted an excellent article on what it characterizes as some of the “positive results,” one year on, produced by the Pope’s landmark Letter to Chinese Catholics, released on June 30, 2007. Unlike most reporting on the after-effects of the letter (or, for that matter, Chinese Catholicism), UCAN’s report doesn’t dwell on Vatican-Beijing relations. Instead, it focuses on the letter’s call for reconciliation between China’s “open” and “underground” Catholics and asks whether progress has been made in forging that consensus. The article offers a tentative yes, and you can read it for yourself, here. 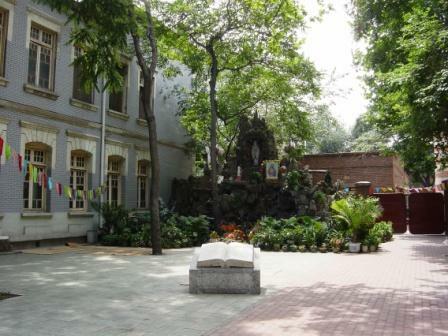 Teresa, an underground Tianjin Catholic, told UCA News more underground Catholics are attending Masses in Xikai Cathedral at which open-Church priests preside, and fewer are praying at the Marian grotto outside. Previously, they refused to enter the cathedral. Just to be clear: the open Catholics pray inside the cathedral, the underground Catholics pray outside the cathedral. Below, a photo of the grotto in question. I took this image a couple of years ago, so if it’s out-of-date, I hope someone can write and correct me (or perhaps provide a more up-to-date image). In the image, the diocesan offices (of the “open” church) are in the building to the left (the building to which the grotto is attached). And, to the very far right, is the back corner of the cathedral building. I don’t know how to put this more bluntly: if Tianjin’s underground Catholics were trying to remain “underground,” they couldn’t have chosen a more public place to do it. Now, I don’t mean to belittle or mock underground Catholics, their sincerity, or their sufferings (past and present). I merely want to point out that the standard view of China’s divided Catholics – underground versus open – is inadequate and misleading. To be sure, there is no question that division exists – but those divisions are rarely a matter of authentic versus inauthentic belief, anymore. In many cases, in fact, they reflect inter-personal divisions formed at much earlier dates, and passed on as a legacy (political, in some cases) of sorts. More on this – at length – in some other forum, at some later date. This entry was posted in Appreciations and Recommendations, Catholicism, Religion by Adam. Bookmark the permalink. I think people also need to keep in mind that, just as South American Catholocism is different than Italian Cathlolocism, Chinese Catholics also have their own way of expressing their faith, which in many cases is similar among “open” and “underground” organizations. The Patriotic Church does, indeed, call on people to pray for the Pope and the mass is in many ways even more traditional than what we have today (no Vatican II). The lines are indeed blurred and once the Vatican and China are reconciled, it may lead to a united Church, but still many issues to deal with. Roman Catholic Chinese will no doubt remain patriotic. Hi, Josh. I’m not sure where you attend Mass, but here in Shenzhen we do use a Mandarin-language Novus Ordo Mass, with the readings corresponding to the three-year lectionary.